The Mount Dora Lighthouse is considered by many purists not to be the real thing - a faux lighthouse, so to speak. We have listed it on our website, however, because it is an official registered aid to inland navigation, and has become one of Mount Dora's best known landmarks and photo opportunities. The lighthouse was dedicated in 1988 and is built of stucco covered bricks. Its light guides boaters on Lake Dora and shows them safely to the adjacent boat ramps and Mount Dora Marina. The lighthouse is only about 35 feet tall, and no access is allowed inside to the public. 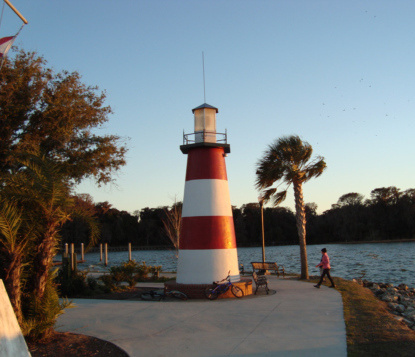 The lighthouse sits on Grantham Point adjacent to Gilbert Park and Simpson's Cove, public parks a short walk from downtown Mount Dora. Locals refer to the lighthouse site as Lighthouse Park. It's a great spot to take a family photo. A nearby attraction is Palm Island Nature Preserve. It features a long boardwalk along the Lake Dora shoreline where you will usually see a variety of water birds and an alligator or two. A local Segway tour visits the lighthouse almost every day, and their is also a guided boat tour that leaves daily from the docks adjacent to the lighthouse. Mount Dora, Florida is a beautiful lakefront town of about 12,000 people located in the wooded hill and lake country some 45 minutes northwest of downtown Orlando. The town has many antique shops in the downtown area, and a huge antique center called Renninger's on the outskirts of town. Mount Dora overlooks beautiful Lake Dora, one of the prettiest lakes in the famous Harris Chain. Mount Dora is one of the three towns that make up Central Florida's "Golden Triangle". The restaurants on this page also include those in the other two triangle towns, Eustis and Tavares. There are dozens of great places to eat in this part of Florida. Like many other small Central Florida towns, Mount Dora's modern history started after the U.S. Civil War. Many descendants of the early pioneers still live in Mount Dora and their family names are displayed prominently on town streets and parks.